A HelloFresh classic! 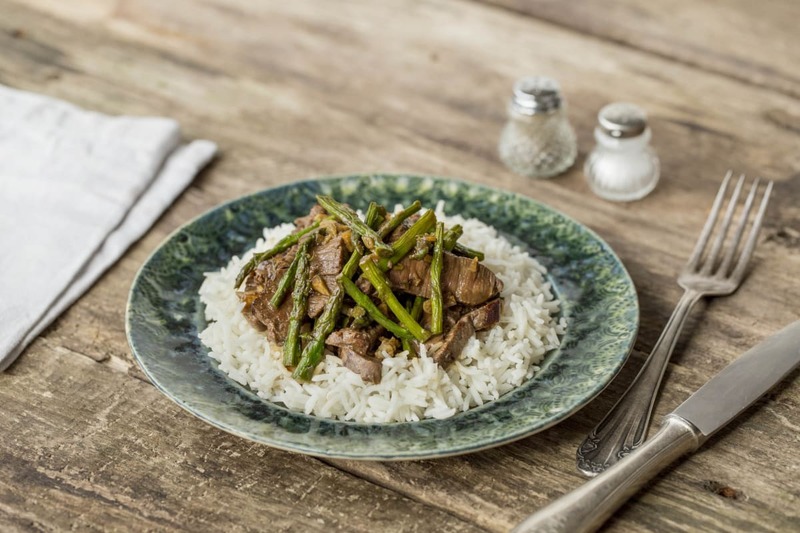 Tender beef and crisp asparagus are quickly stir-fried with warming ginger and served over fluffy basmati rice. Hoisin sauce adds a touch of sweetness and depth of flavor. In a small pot, bring 1 1/2 cups water to a boil with a pinch of salt. 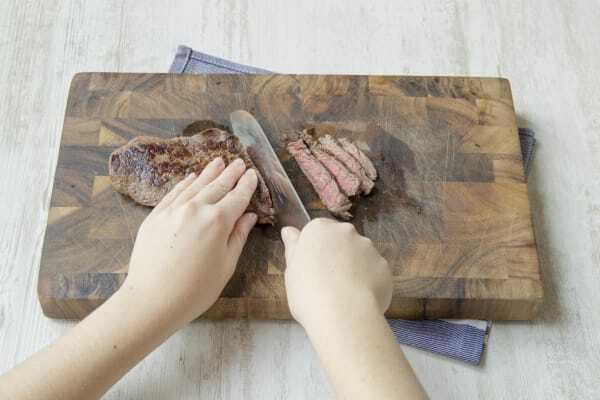 Take the steak out of the fridge to bring to room temperature. 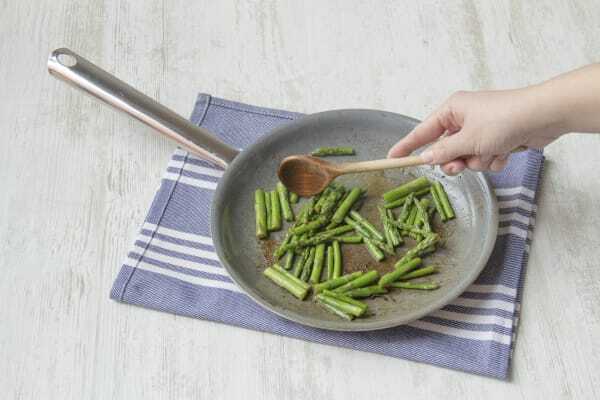 Cut the asparagus spears into 2-inch pieces, discarding the bottom inch. Mince or grate the garlic. Peel the ginger with a spoon, then mince or grate 1 tablespoon. Add the rice to the boiling water. Return to a boil, reduce to a simmer, and cover. Cook for 15 minutes, then set aside off the heat for 5 minutes. No peeking! Meanwhile, heat 1 tablespoon oil in a non-stick pan over medium-high heat. Season the steak with salt and pepper on each side. Sear for 2-3 minutes on each side until golden brown. Set aside. In a bowl, combine garlic, ginger, soy sauce, hoisin, and 2 tablespoons water. Stir until thoroughly combined. In the same pan you cooked the steak in, cook the asparagus over medium heat for about 5 minutes, tossing constantly. While the asparagus cooks, thinly slice the steak against the grain. Add the steak to the pan with the soy sauce mixture. 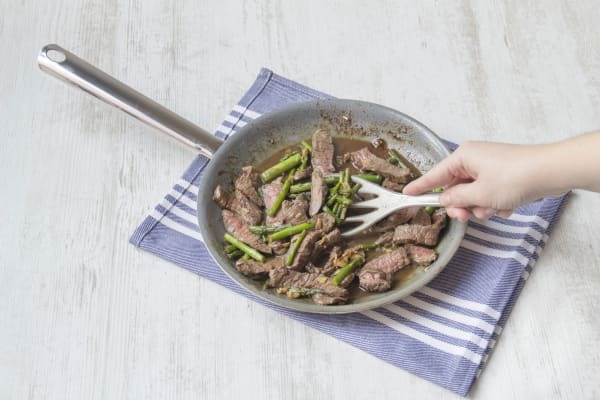 Cook, tossing, for about 5 minutes, until steak is cooked, asparagus are tender, and sauce has slightly thickened. Fluff the rice with a fork. Serve the ginger beef stir-fry on top and drizzle with any remaining sauce.